Stackable birthstone rings are a beautiful way to wear your love. Each stacking ring is stamped with an initial ~ they look great alone or stacked with our other birthstone bands! Get one to represent each of your children or grandchildren. If you want to mix and match the different shape stacking bands, click here to design your own stack ring! 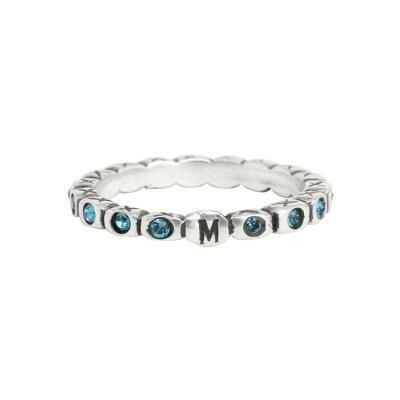 Stackable Birthstone Rings stamped with an initial are the perfect mother's birthstone ring. Each infinity band has birthstone crystals for the month chosen and an initial stamped on a silver blank. Stack multiple rings together to create a special ring! Care: The birthstone crystals are epoxied into the sterling silver band with a heavy duty epoxy. The stones should stay in place for years if taken care of properly. The rings are not designed to be worn 24/7 and should be removed when working with chemicals, household cleaning agents, swimming, bathing or washing your hands. Also, do not ever use hand sanitizer while wearing the rings. We guarantee the stones for 6 months. After that time, we will replace the stone(s) should they fall out but there is a $10 charge which includes the return shipping fee. Dimensions: The sterling silver bands are approx 3mm wide and is stamped with 1 initial. Please make sure to see the birthstone chart to see available birthstone colors. We do not mix birthstones within one ring - only one month's birthstones will be but in each ring. Price includes stamping. Because this item is customized all sales are final. Sizing: When determining your size, we ask that you give us a size that fits comfortably. If you are unsure of your size, you can purchase a ring and select ring sizer from the dropdown menu. We will send you a ring sizer and instructions on how to email us your size. If you are between sizes you need to decide if you want the ring to fit a little snug or loose. We can not resize the birthstone rings because of the setting so please make sure to order the correct size. Please note: Stacking two or more rings will make the total width wider, which will make for a snug fit on your finger so please take that into account and consider ordering a larger size if you plan on stacking 2 or more of these bands. © 2016 Nelle & Lizzy LLC. All Rights Reserved.